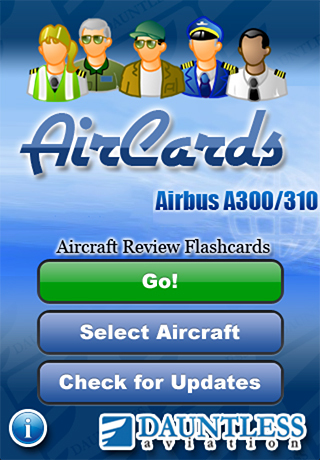 You are welcome to download the AirCards iPhone/iPad app for FREE! Individual aircraft titles within the free app can be evaluated in demo mode. If you'd like to get full-access to a given aircraft in the app, this can be obtained via in-app purchase. Yes! The app works in 'native size' for both iPhone and iPad type devices. Yes! If you have both an iPhone and and iPad, you only need to buy any given AirCards aircraft one time to get it on both devices (or even more if you have more), assuming they are both/all linked to the same iTunes AppStore account. Yes! The iPhone/iPad versions feature up to date content and free lifetime updates just like the PC version. It is 100% the same content. All available AirCards aircraft are available in the single download below. You can study and activate the specific aircraft that appeal to you. You are welcome to download the app FREE from the AppStore, right now. The iOS™ apps on this page work great with your iPhone™, iPad™, iPod touch™, or other compatible device only - however, they are NOT intended for use with your PC or Mac. Your iOS™ device is designed to get compatible apps from the iTunes AppStore™. You are welcome to obtain our iOS™ apps, therefore, uniquely from the iTunes AppStore-- just as is the case for all equivalent apps from all other companies eveywhere. These iOS™ apps (programs) have been needed to be specifically designed, programmed, and tested (a process involving hundreds to thousands of hours and specialized skills and tools) to work on iOS™ devices and they certainly do work great on them. However, this also means that they work on iOS™ devices only--purchases made via the iTunes AppStore™ are not compatible with and will not work on, for example, your PC or Mac. If you'd like to use a given app for both your iPhone / iPad / iPod and its equivalent piece of software for your PC or Mac (where one is available), as some people do in order to get 'the best of both worlds', you would need to purchase these separately. This 'a la carte' system ensures that you pay for only that which you intend to use and is fair to all involved. At any rate, it could not be differently due to Apple's sensible policy that its AppStore is for iOS apps only and effectively that no 'intermingling' is allowed. This software is for any pilots who need to learn aircraft systems for a checkride, simulator-ride, type rating course, and so forth. Basically, this software has all the advantages of learning with traditional flashcards and adds to this many advantages that computerization can offer. It's great for, for example, memorizing limitations (V-speeds, and the like). The price varies by aircraft, but it is very reasonable. For the prices, see the AirCards order page. When you buy AirCards, you buy a single-user, nontransferable license to one aircraft. You can of course buy more than one, but each one must be purchased separately. The prices for the aircraft vary not only because of the differing amounts of specialized expertise that went into creating each bank, but also because the size and scope of the banks varies as well. Some are fairly comprehensive systems reviews, while others are more quick limitations and key systems memorization aids. To make sure that you're happy, the best thing to do is to download the demo version of AirCards for the aircraft you are interested in and try it. Remember, each demo version has about 5% of the total number of questions enabled. Registering / Unlocking / Buying (they all mean the same thing) unlocks the remaining 95% of the questions. When you purchase AirCards, unless otherwise authorized by us, you are purchasing a single-user, nontransferable license to the software. We offer free lifetime updates AND we let you install this on more than one machine (for example, your desktop and your laptop) as long as you promise that it is for your own PERSONAL study and use only. In exchange for these generous terms, we ask that you hold up your end of the bargain by directing your friends and colleagues to purchase their OWN copy of AirCards. We hope you can find this to be fair. I need to memorize key limitations for my checkride / simulator ride / recurrent training / etc. AirCards titles are broken down into chapters. In general, most have chapters that have such key memory items there. 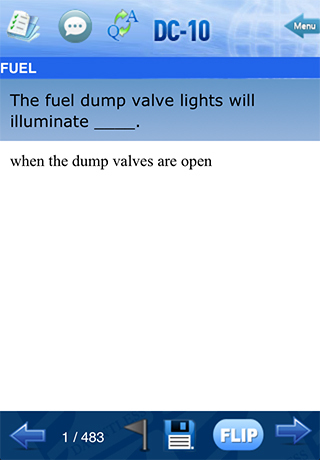 AirCards is a memorization machine! One of the whole points and strengths of the software is how it helps you memorize such things as quickly and painlessly as possible. What about airline or company specific flows, checklists, memory items, and so forth? The AirCards downloads you see above are written for individual AIRCRAFT, NOT individual companies. They are for the most part systems trainers, not procedures trainers (though for the GA and bizjet aircraft, there are a number of procedural questions where they are appropriate and generic). However, the base software of AirCards is VERY CAPABLE of teaching airline or operator specific information. 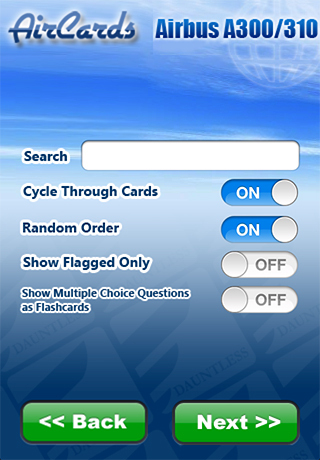 We can help you provide custom versions of Aircards to your pilots very competitively--this includes access to our online web-based flashcard editing tool that will allow you to manage your content online and have participating pilots be able to update it seamlessly through the software's built in features. We handle it all - this is not pie in the sky talk - a comprehensive system is ready NOW to handle your needs in this area. It's a very capable and easy system, but it's a bit too much to describe here. If you're interested in having us make a company-specific version of AirCards for you, please contact us via the "contact" link at left and we will tell you more personally. What happens if I see an error in AirCards? For the unlikely but always possible case where there is an error in AirCards, there are links inside the program that let you quickly report the suspected problem to the author responsible for that aircraft. The issue will be looked into. If a change or clarification is made to the content, it is possible to update your aircards using the built-in 'self-update' feature. Yes, updates are always free to registered users. Always trust the POH/AFM as the definitive source of information for any aircraft. Verify all information provided by AirCards against an authoritative source prior to flight in your aircraft. Sorry - we'll add more aircraft over time, but we can only do what we can. That said, we are always interested in working with pilots in developing new versions of AirCards. If you think you can develop similar high quality content for an aircraft not listed here, please contact us via the contact link at left and let us know about it. We're always looking for good authors. For technical, pre-sales, and customer support, please contact us via our Helpdesk. There, you will also find frequently asked questions more suited to technical issues relating to the software. Thank you for your interest in AirCards. Tailwinds!